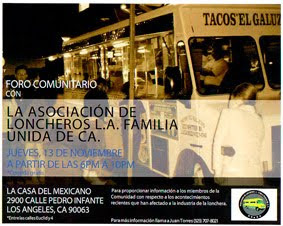 that has been slinging some of the tastiest bombs of flavor you'll find north of Huntington Dr. Then there is El Gallito, a taco truck just 100 yards north on Fair Oaks that boasts one of LA’s smokiest salsas to pair with suadero beef rib tacos and tacos al pastor cut from the rotating spit.Each truck has it's fans and although it's not on the scale of Geno's and Pat's great steak debate in Philly there is a certain amount of loyalty taco patrons show to each truck. 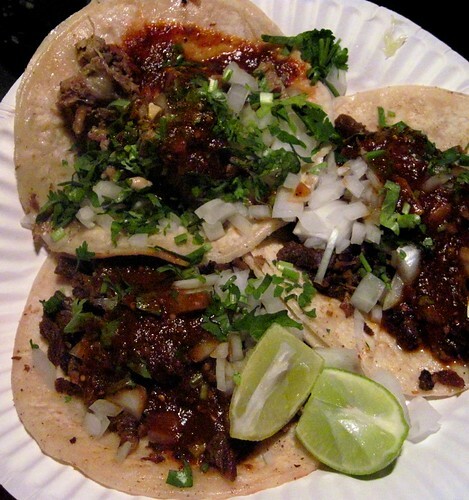 The carne asada tacos at El Taquito Mexicano are classic LA tacos. These are small two biters with a spicy salsa roja that have both flavor and heat. The taquero, cleaver in hand, asks what kind of tacos you want, whether you want them spicy or mild and how many. 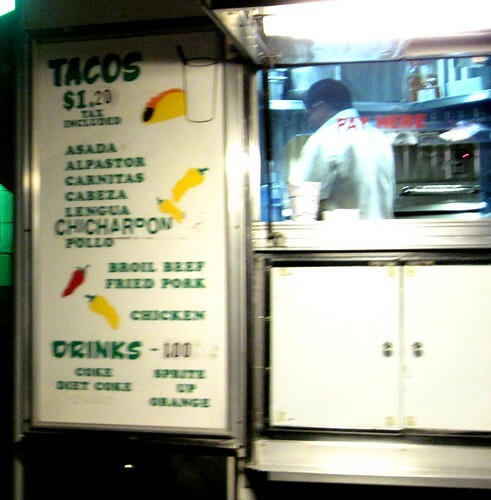 Once he hears your order he chops away like a taquero master scooping up the meat with the tortillas all one motion. 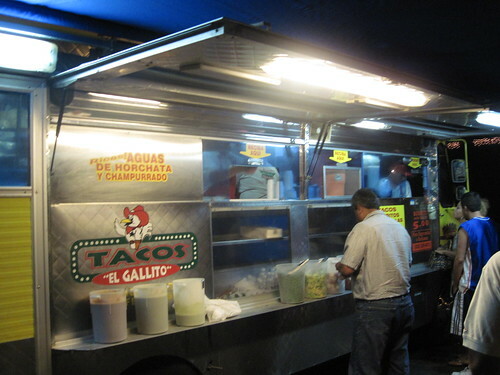 El Gallito(pictured above) offers more variety. The tacos are a little heftier and you garnish them yourself. There’s an avocado salsa, a salsa verde, and a smoky dark salsa. Onions, cilantro, radishes, limes and cucumbers round out the plethora of options to garnish your tacos with. Order the Al pastor that is cut from the rotating spit. If you want something more tender than your standard carne asada order the suadero, a taco of tender beef rib. Pair both tacos with the smoky dark salsa and a bottle of jarritos. On the weekends you will find lines at both trucks. Sometimes the line to El Taquito goes all the way to the sidewalk. On my last visit to El Taquito Mexicano there were a couple police officers eating tacos while people ran back and forth across Fair Oaks Blvd clearly breaking the jay walking laws. The police may have understood though, tacos this good may be worth the ticket. Which truck is better? Neither. When they are both on their game they pump out some of the best tacos in the city. 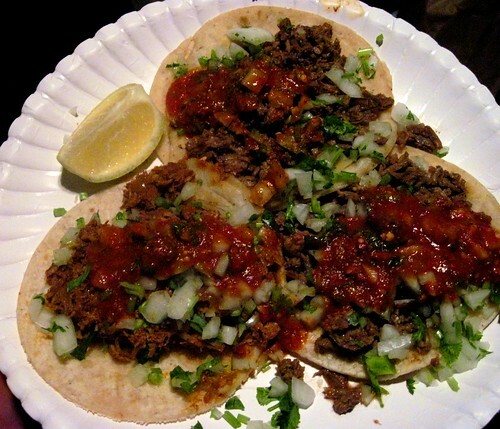 If you prefer small tacos with a spicy shot of salsa that makes your forehead sweat head to El Taquito. If you wan't more complexity and a little less heat head to Tacos El Gallito. Or just do what I do every time i'm on Fair Oaks and try both. Only three reviews in the SGV is pathetic. The SGV is part of the 5 burrows and not like the IE which of course is New Jersey. I've seen some on Valley, just drive from Alhambra/ Monterey Park going east, after 7pm. Never stopped at any, some look crowded. Stopped by El Taquito. Didn't compare to the better trucks I've had. It wasn't terrible, but not as good this review made it sounds. Maybe it was an off night. Living in San Gabriel, I've tried both trucks on several ocassions. The easiest way to judge which truck to stop at, the cure for the the late night munchies, would depend on what you're in the mood for. If you want tacos, definately hit El Taquito. Their carnitas and al pastor are my choice. If you want something besides tacos then El Gallito would be the place to be, they have a good variety. One small gripe I have with El Gallito is that they have the condiments as self-serve, not sure about cleanliness with so many people serving themselves. Both trucks are clean and friendly. These two trucks are my favorites in the area. Was really unimpressed with El Taquitos Carne Asada. It was mushy almost and tasted faintly of other things like it had been boiled instead of grilled. Gallito's on the other hand was damn near PERFECT. Also I like to dress my own and Taquito does it for you.